Writing is easier than every with Scrivener. But with all that production you’ve got to release some work to the public. When you launch your book you need to hit the road and do some marketing. One of the most used marketing tools is the blog tour. 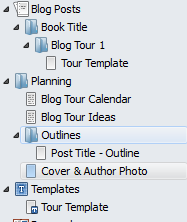 Why not use Scrivener to develop your blog tours? Much like a blog template you can use a blog tour template to write for all your stops and keep them organized. Try setting up a project for your book release and organize it by blog tour. Get a head start as tour ideas come to mind and write them down. Then when it comes time to release your work and do frequent blog tours you’ll have plenty of material for all the stops. I’ve modified a blog template to use specifically for with blog tours which you can download for free here. Organize your binder, use the table in the calendar container to track your schedule. Use the document template or create new ones for your various needs as they arise. Want to develop your own templates? Here are instructions on creating and managing project templates. Need to know more about making document templates? Click here to learn to create a document template and here to learn more about what to put in them. Are you looking for a way to organize your blog tour ideas? Please share your thoughts and ideas in the comments section. I’d also love to connect with you over social media so check my Contact page for that information. Interested in more of my writing? Just click one of the retailer banners on the sidebar to see more. Just as a note: I am not affliated with Scrivener in any official capacity. For support questions, pricing and other concerns please contact the vendor. Interesting. I couldn’t open the free template, however. Oh, did you import it into Scrivener first?